One of my Sunday paper route customers was Albert Greenslaw. 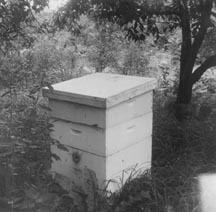 His home near the Post Office had a back yard filled with bee hives. On a particularly nice fall day, I was collecting and noticed activity in the backyard. The smokers were going, the hive opened and honey being harvested. Of course I was curious. "The smoke quiets the bees," I'm informed, so I step closer and one bee didn't get quiet, having just returned from the field with its leg pouches full. Enraged at what it found, it took aim and hit me just below the left eye. Several days of suffering later, Albert met me and commented how well I tolerated the attack. Got everything up and running. Placed the box and released the queen on top of the main frames and closed it all up with an empty super, until the colony was settled. Before harvesting any honey, I joined the Navy and the hive died out. Now that I know how to do it, I bet it would succeed next time.